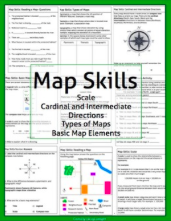 Map skills are often considered a blip in the curriculum that must be taught before moving onto more interesting topics. Students have trouble understanding why map skills are important to understand ("but I can just use my GPS"), often making it a difficult subject for both teacher and student. But maps can help us understand the world around us- not just what road we should take, but a variety of information that can give us insight into people and culture. So how do we make those basic map skills more engaging and interesting for students? If you have the resources to get a bunch of compasses into your classroom, release your students into the school yard for spontaneous exploration. These these maps show information across space in fun and interesting ways. For example: most popular sport by country. (Please use your discretion with these, pick and choose the ones you would like to use as some will obviously not be appropriate for students). Get students moving as you reinforce concepts like the cardinal and intermediate directions. As students became more confident in the directions they will be more sure in their movements throughout the exercises. See the resources at the end of this post for links to TpT products with full body activities included. Students become more familiar with the local area as they investigate maps from local areas or landmarks. Get several different types of maps that look at the same area (for example the area surrounding your school or town) but which show different information. For example: planimetric, thematic, and topographic, to compare which types of maps show different types of information. Have students create a map of the schoolyard or your classroom. Using a space they are familiar with makes this both interesting and not too challenging for them ask they learn about the basic map features. 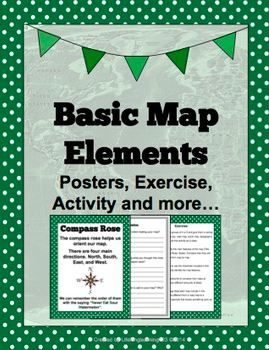 This activity can be found as part of my Map Skills Package (see resources at the end of post). Use Google Earth to take students on a tour of scale. Start by zooming in to your school, ask students which features they can identify. Zoom out to the surrounding neighbourhood, which details can they no longer see? Is there something new that they can see? Zoom out to the town, county, province, country, and global scale. Repeat the same questions so that students analyze what they can see at each scale and what they might be able to do with the information provided at different scales. This package includes four posters with the basic map elements: Scale, Title, Compass Rose, and Legend. It also contains a worksheet for students to complete a mapping activity of their classroom, with a focus on the basic map elements. There are also ideas for a class map exploration exercise and discussion questions to go with the activity. 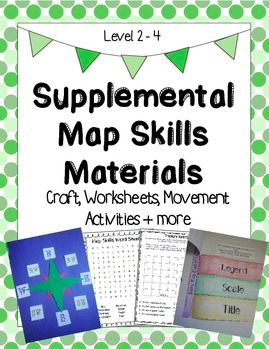 This product contains a variety of materials to supplement your student's understanding of map skills. Topics include cardinal and intermediate directions and the four basic map elements (title, scale, compass rose, and legend). There are a variety of types of worksheets and activities to support student review and learning. 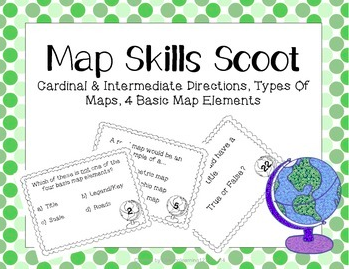 In this game students review their knowledge of basic map skills through a fun, fast-paced game of scoot!